Please include your name, email, and months you want to sign up for in the notes. Please choose SEND MONEY TO FRIENDS AND FAMILY when you send your entry fee. If you do not choose that, we will be charged a fee. In those cases, we will have to issue you a refund and ask you to resubmit your entry fee(s). There is no fee if using your PayPal or bank account, but there is a small fee for using a Credit Card. Registering with a credit card includes a processing fee. Check out the Register with PayPal section in this page for another option. 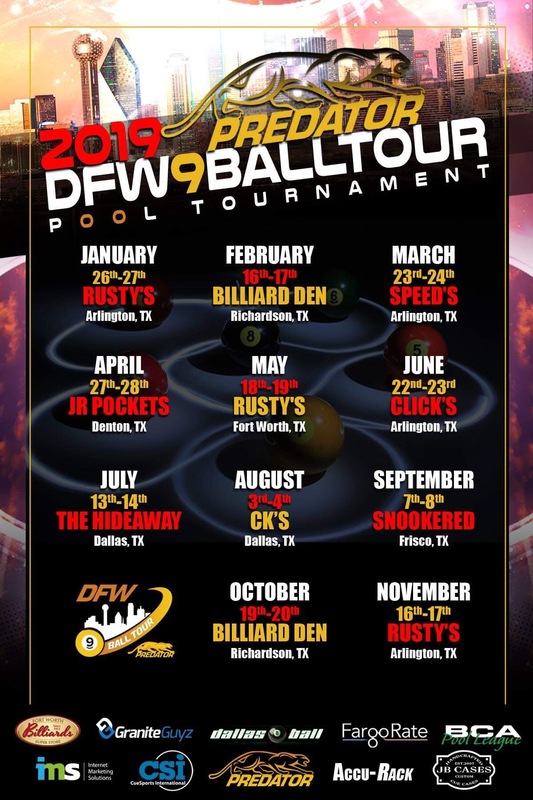 DFW 9 Ball Tour was the previous Tour which Melinda Bailey has successfully ran for the past 5 years. If you cancel by the Saturday BEFORE the weekend of the tournament, you will get a full refund. If you cancel by Wednesday before the tournament, we will retain a $10 fee. If you cancel between Wednesday and day of the tournament, then we will retain a $20 fee. If you are a no call, no show the day of the tournament, you will lose your entire entry fee.